Following on from my previous post on bringing data from Twitter into SQL Server, you’ll recall that we were able to take data from a JSON data feed, using cURL, and parse it into SQL Server, using a custom Function. This enabled the twitter feed to be loaded into a SQL database at the staggering performance of 38 records a second. In a future post, I hope to do some optimisation on the T-SQL process for getting this data in. However, I wanted to see how quickly the data could be loaded using a C# application (since I’m a bit of a closet coder). So, following on from Step 1 and Step 2 from the previous post, so you’ve taken the feeds from Twitter, and loaded the data into a Load table in SQL, I then want to get the data into a table in SQL Server. There are several JSON libraries that are available, that link to C# (a list is here: http://json.org/). I chose JSON.NET (http://json.codeplex.com/) on the basis that it was quite frequently mentioned on StackOverflow (so if I had any questions, I’d stand a reasonable chance of getting an answer), and the examples looked pretty straightforward. Having fired up VS 2012, I created a project, and added JSON.Net into it using NuGet (I like NuGet! ), using Install-Package Newtonsoft.Json. Obviously, this code is an example, and you’d be wanting to have proper error handling, better functional layout, better commenting, etc, etc, etc in there, however, you can see how the code runs, and from a performance perspective, it’s better. Running this code through the Debug mode in Visual Studio, I managed to get 155 records processed a second, pretty snappy. Then, running it as an Application, outside Visual Studio I got 393 records a second! 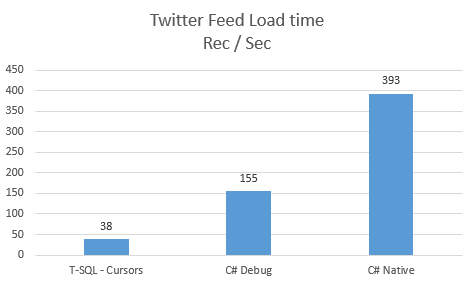 Just over 10 times faster than T-SQL with a Cursor. I’ve been looking at how it might be possible to bring data from Twitter into SQL Server. You might ask, Why ???? Well, why not ? It’s more an exercise in how this could be done using tools that are available. There are several steps that I went through, and I’m pretty sure there may be a better way, and if you can think of any improvements, then feel free to use the comments section below. First up, we need to get the Twitter data. There are numerous ways to do this, however, the easiest way I’ve found is to use a product called cURL (available here: http://curl.haxx.se/download.html). I saw this referenced while investigating the Microsoft Hadoop on Azure site (https://www.windowsazure.com/en-us/develop/net/tutorials/hadoop-social-web-data/) which was used to extract data to feed into a Hive database. There are three parts to obtaining the Twitter data using cURL. Part 1 – Get cURL, you can download this using the link above. I used the Win64 Binary SSL version. Part 2 – Create a parameters file. As the MS link above shows, the parameters file acts as a filter to get the data you want from the Twitter feed. While it is possible to filter the data by hashtags, I wanted to get a more generalised set of data. To do this, I put the following filter in the parameters file. This effectively filters the data by any tweets that are geotagged. Part 3 – Create a batch file to run the job. The batch file created is effectively the same as the one referenced in the MS link. The file is called GetTwitterStream.cmd, and contains the following text. You need to replace <twitterusername> and <twitterpassword> with your twitter credentials. When you run the GetTwitterStream.cmd file, it starts cURL and starts getting data from the public Twitter streaming API, as shown below. This gives us a file containing the JSON feed from Twitter. So now, we have a table with the JSON data in, and an Identity column to give us an ID we can reference. Phil Factor has written a great article (here http://www.simple-talk.com/sql/t-sql-programming/consuming-json-strings-in-sql-server/), which covers parsing JSON in T-SQL. I used the parseJSON function from this article, to extract the required fields from the Load table. Then used the following process to iterate through the data and get it into the right format. The process followed here is to create a Cursor (I’ll get to this in a minute) with the records to change, and call the ParseJSON function against it to split the fields out, then to get the fields we want and insert them into a table. Next we set the Processed flag, and repeat the process till there are no more records to process. To allow this process to run in a reasonable amount of time, I created a couple of indexes on the load table (tweetJSON). The indexes are on the ID field (Clustered Index) and on the Processed flag. Running this process took approx. 26 seconds to load 1000 records, so approx. 38 records a second. So, I thought I’d try it with a While clause, rather than a cursor, and interestingly, it took the same amount of time to run, for 1000 records. Update: As raised by Dave Ballantyne (@davebally), this shows that a While clause is effectively doing the same as the Cursor, since the process is still running over records one by one. (Further information can be found here). Thanks for reading! I’ll add an update when I’ve made changes to make it more performant.